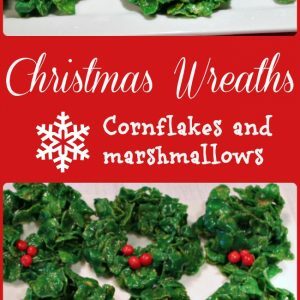 Cornflake Marshmallow Christmas Wreaths are a huge tradition in our family. Grandma used to make these every year and hide them in her closet. Because she knew if she left them anywhere else the early arrivers would sniff them out and every piece would be gone when she was ready to serve them. Everybody liked them – crispy, chewy and bright green. That was THE most requested recipe when we compiled a book of Grandma’s recipes one year. I made a batch for Thanksgiving this year. The wreaths were noted the minute they came in the house. Everyone was grown up until dessert time . . . . and then they were gone in a flash. No chance of this tradition making it to the next generation. They do not have a whisper of hope in ever getting a taste. 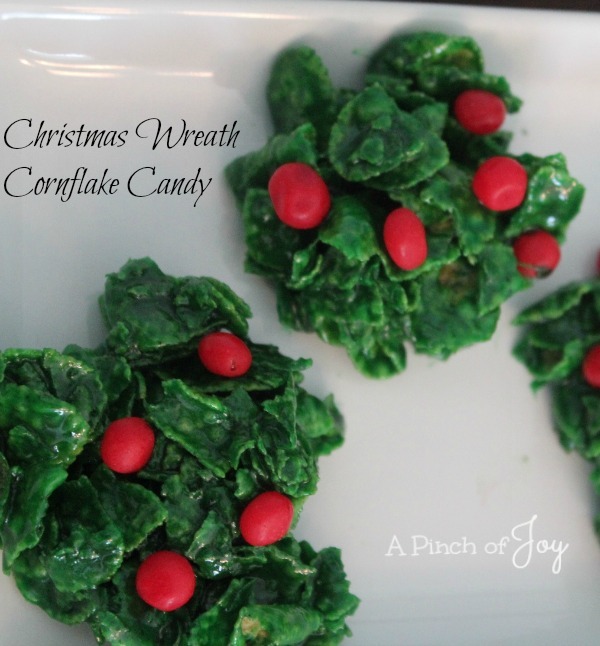 Crispy, chewy and festive -- The most requested recipe from Grandma's recipe box! Remove from heat. Add corn flakes and mix until corn flakes are thoroughly coated, being careful not to crush the flakes. Let cool just enough to handle safely. Drop by spoonfuls onto no-stick aluminum foil for holly bunches or heap two spoonfuls together for wreaths. Use the rounded tip of a wooden spoon coated in butter to make center opening in wreath. Lightly butter hands to quickly shape the outside of each wreath. Add 3 Imperials to each wreath while still slightly warm and sticky. Good morning Charlene, I wanted to let you know that your recipes is being featured on Oh my Heartsie Girls Friday Features this week. And I will be making these this week! Your post has also been pinned. Thank you!! I’m honored to be featured and always appreciate a pin! !